ScienceDaily (2001-12-12) — Crows and ravens are depicted as being clever and tricky animals in countless American Indian stories and legends. Those characterizations apparently are right on the mark, according to a pair of University of Washington researchers who have found a species of crow that is constantly looking for opportunities to steal food from other members of its flock. I started to suspect this myself having watched them eat so often the past few months. I watch them eat daily. I have observed their sneaky behavior. 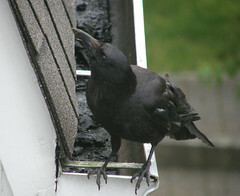 We have many Northwestern crows up here being the Northwest and all. =) When we first put the meat out, they did behave as if they were sneaking food from a BBQ. It made me wonder how many times birds sneaked off with a little bit of the meat patties or meat clumps people leave on plates on their porch while they run inside really quick. It seemed obvious to me they thought they were sneaking off with some food. So, you better watch your BBQ a little more carefully… or leave out peanuts for the crows and they will be less tempted to steal a bit of the BBQ action! Thankfully, I am mostly vegetarian so I don’t have much to fret.